From June 21-July 3, 2012, the National Council on U.S.-Arab Relations, in partnership with the Lebanon Renaissance Foundation, organized and escorted ten students on a study visit to Lebanon. The delegation was led by National Council Malone Fellow and Model Arab League advisor Professor Linda Pappas Funsch, who lived in Beirut for several years in the 1970s while working for the Ford Foundation. Professor Funsch contributed several stories about the visit to the Frederick News-Post. Linda Pappas Funsch, “Lebanon,” The Frederick News-Post, December 2, 2012. From June 21-July 3, 2012, the National Council, in partnership with the Lebanon Renaissance Foundation, organized and escorted ten students on a study visit to Lebanon. The delegation was made up primarily of alumni from the Council’s Model Arab League Student Leadership Development Program. Through the study visit the students gained direct personal experience in Lebanese culture, society, and economics, and came away with a more deeply informed knowledge of Lebanon’s strategic aims and requirements as they pertain to Lebanese-U.S. relations and Lebanon’s role in regional and world affairs. “Lebanon” by Linda Pappas Funsch, The Frederick News-Post, December 2, 2012. 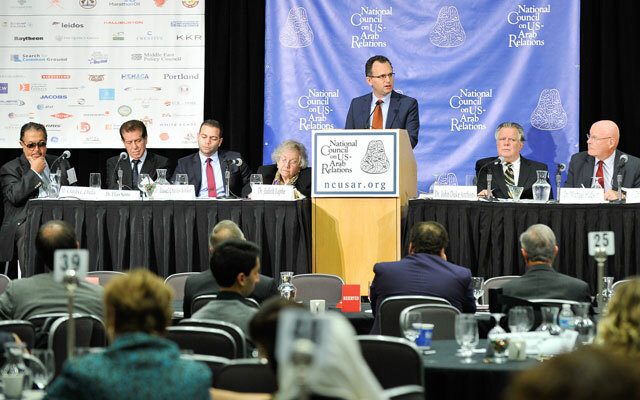 Geo-Political Dynamics (IV): Syria and Lebanon – 2009 Arab-U.S. Policymakers Conference from NCUSAR on Vimeo. Chair: Ms. Martha Kessler − Former intelligence officer, Central Intelligence Agency working on the Middle East and South Asia; multiple positions throughout the Directorate of Intelligence, serving three tours on the National Intelligence Council; consultant to multiple United States government agencies on the Near East and South Asia; and author of, among other works, Syria: Fragile Mosaic of Power. H.E. Dr. Imad Moustapha − Ambassador of the Syrian Arab Republic to the United States; former Dean of the Faculty of Information Technology, University of Damascus; former consultant to international and regional organizations on science and technology policy in the Middle East. Dr. Laurie E. King − Former Managing Editor, Journal of Palestine Studies; Adjunct Professor, Arab Studies Program, Georgetown University; and former Professor, Lebanese-American University. Dr. Graeme Bannerman − International Elections Observer for Lebanon (once) and the Occupied Palestinian Territories (three times); Founder, Bannerman Associates, a political consultancy firm specializing in Egypt, Lebanon, Turkey, and other Middle Eastern countries; and former Staff Director, U.S. Senate Foreign Relations Committee and the Committee’s Professional Staff Member for Middle East and South Asia Affairs. Chair: The Honorable Edward W. Gnehm, Jr. – Kuwait Professor of Gulf and Arabian Peninsula Affairs, Elliot School of International Affairs, The George Washington University; former United States Ambassador to the Hashemite Kingdom of Jordan; former United States Ambassador to Australia; former director General of the Foreign Service and Director of Personnel for the Department of State; 36-year career in the United States Foreign Service. Dr. Daoud Khairallah, Esq. −Adjunct Professor of International Law at Georgetown University Law Center and the Nitze School of Advanced International Studies, Johns Hopkins University, Washington, D.C.
Dr. Daoud Khairallah, Esq., Adjunct Professor of International Law at Georgetown University Law Center, and the School of Advanced International Studies, Johns Hopkins University, Washington, D.C.